Plantar fasciitis is a pain in the feet. Plantar fasciitis is a medical denotation when the plantar fascia develops inflammation. The plantar fascia is the connecting tissue which runs beneath your feet. In case you have had pain anytime under your feet while taking the first steps coming out of the bed early in the morning. You must have sometimes experienced this condition which is so painful. In a lot of people, plantar fasciitis has been mostly connected with the overuse or even a rapid change in the level of activity. However, cutting off from the activity can offer a solution to your problem. Moreover increase in weight also contributes to developing plantar fasciitis in a lot of people. By following weight loss plans is one of the ways of how to get rid of plantar fasciitis fast. Furthermore, previous injuries in a foot, weak arch support or even tight muscles that are around the feet can all prepossess you to get plantar fasciitis. Moreover, there are a lot of interesting as well as advanced kind of treatments. These will help you to be relieved of your pain and discomfort. Few simple things are there that you may do while at home in preventing plantar fasciitis and get speedy recovery from it. When your calf muscles get tight, they start pulling on your heel bone and make the plantar fascia tight and inclined to injuries. So, in order in helping those muscles to loosen uptake either any belt or even a towel to noise it about your foot’s ball. By placing your legs straight, gently try pulling in the direction of your body. Do it till you start feeling any stretch in your legs lower portion. Hold it in that position for minimum 30 secs. Keep repeating these five times before coming out of your bed. This helps in loosening up your tissues which cause you irritation. An easy way to do it is by pulling up your toes using your hands till you start feeling a kind of stretch on your foot’s ball. The stretch can be felt from the foot’s ball up to the heel. Hold onto that position for minimum 30 secs. By doing this you will not need to think of new ways of how to get rid of plantar fasciitis fast. Performing plantar fasciitis stretches does not require the use of any exercise equipment nor do you need to enroll in a gym, you can do these exercises with the use of simple things at home. The easiest stretching exercise is to pull your toes upwards. Start by sitting on the floor and stretching both your legs in front of you. Relax and reach for the toes of your affected foot. Grab your toes with your fingers and keep them up. Do this for about 20 to 30 seconds. Maintain the position if you can but if you feel the slightest pain, stop what you are doing. Release your hold after 30 seconds and allow your feet (and arms) to relax. Repeat the routine 4 to 5 times or if you can. Preferably do this stretching exercise three to four times a day. You may also use a simple rolling exercise which makes use of simple items around the house. A water bottle filled with water, a tennis ball or a rolling pin will do. Sit on a chair and relax. Use the water bottle to roll onto the arc of the foot. With a slightly downwards push, allow the water bottle to come in contact on the sole of the foot. Roll the bottle with your foot. You may do this technique as often as you possibly can. You may also advice cold water bottles or cooled tennis balls that will easily remove pain. If there is any type of pain while you perform this simple exercise, stop and continue only when there is no more pain or discomfort felt. There are so much more plantar stretches that you can do and all are available online. You can also seek consult from a physical therapist for sound and effective advice in what exercise routine you can use that will provide you with the best pain-free result. A specialist for this condition will also be able to suggest the most impressive treatment that can solve plantar symptoms. A good massage under of your feet is an effective way of how to get rid of plantar fasciitis. However, if you are in search of a less expensive option you can make use of a tennis ball to relieve you of your pain. Place the tennis ball on the floor. Gently start to roll it beneath your foot till some minutes. This helps in loosening of your plantar fascia thereby making it less irritated. If you want a strong massage to apply more pressure onto the ball. Put your foot onto a frozen water bottle which is on the floor and roll your foot on it for almost few minutes. 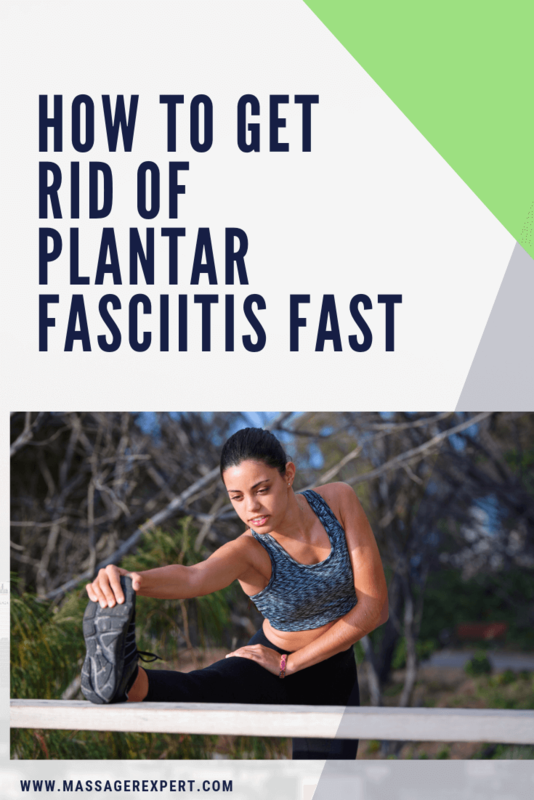 This is also a good way of how to get rid of plantar fasciitis fast.